The title refers to the American spiritual There is a balm in Gilead. It is my thank-you to my adoptive state. It has been framed brilliantly by The Framery of Vermont in Chester, VT to show Winter Night turning into Summer Day. 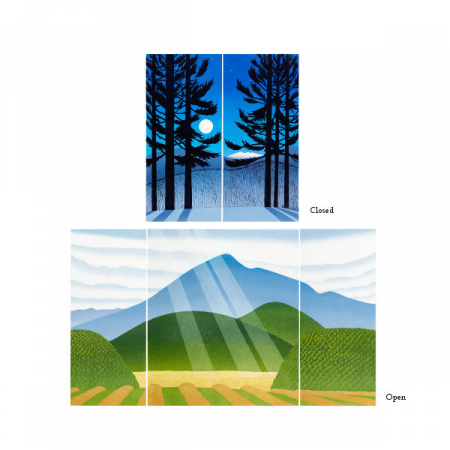 When open, the unframed version is 28 1/2 inches high by 49 1/2 inches wide. When closed, it measures 28 1/2 inches high by 24 1/2 inches wide. When open, the framed version is 29 inches high by 50 inches wide. When closed, it is 29 inches high by 25 inches wide. Framed 25/50" x 29", Unframed 24.5" x 28.5"